A player who has won premierships, taken part in numerous State of Origin campaigns for NSW while playing test matches for the Kangaroos. Luke Lewis has achieved numerous sporting goals and dreams. 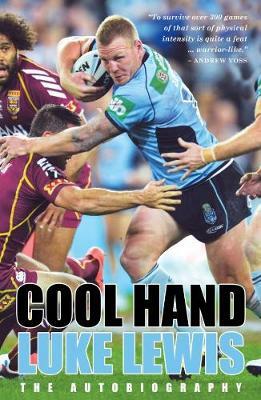 In his autobiography Cool Hands, Luke takes us through his story in his own words, telling of his time with the Panthers in 2003, playing for NSW alongside a personal hero in 2004, representing Australia in 2009 and even his emotional journey through deciding to leave the Panthers to join the Cronulla Sharks in 2013. Luke's time with the Sharks lead to him being the integral part in securing Cronulla's 2016 Grand Final win. Along this arduous and rewarding journey, Luke managed to keep cool thanks to the support of his family, friends and many teammates he had to see him through his career. Join us at Berkelouw Books Cronulla on Saturday December 15th for the official Book signing at 12pm and meet the great Luke Lewis, player, husband, father and now a published author.